Are you looking for the best website design Bournemouth has to offer you? South Coast Web cannot only offer you the best design but the best development and SEO services too. Call us on 01202 665855 for more information on any of our services to ensure you get the best website possible. Website design is important for your website as you need it to look good; without it looking good people will not stay on your site. Not only does it need to look good, but it also needs to be simple and easy to navigate, something our website design team can achieve for you. South Coast Web has over 20 years of experience to deliver you the best website design Bournemouth has to offer you, meaning you can rest assured that our team know what they’re doing. We have four great packages to offer you if you need a brochure website designed, all of which come with one-year free web hosting on our servers. Our team are happy to hear your suggestions and will keep working on your website until you are happy with the result. 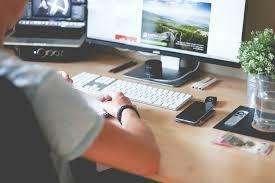 Going to one company to get everything done for your website is the best way forward which is why South Coast Web are happy to provide all these services for you. Using us as your sole company cuts out the delays in-between work in addition to giving you the best all-round quality. Our team are always happy to discuss your websites’ progress over the phone, alternatively, you can pop into our office to have a meeting to see for yourself how your website is looking. Choose South Coast Web for the best development, SEO and website design Bournemouth has to offer you. Our development team uses the latest coding techniques to ensure your website works efficiently. South Coast Web understands that mobiles are predominantly used over desktops to search for websites therefore, we ensure that every website we develop in addition to designing, is mobile friendly, resulting in a greater presence in search engines. After finishing your website at South Coast Web, to get the most out of it, you should get it optimised with us. Unfortunately, having a great website doesn’t automatically make it appear high in the Google rankings; this is where SEO comes in. Our team will run a free SEO audit on your website to identify the key areas that need to be optimised. After this, they will plan a campaign for your website and execute it, giving you regular reports on your websites’ progress. After a few short months, you will see that your website has climbed the rankings in Google, allowing the traffic to increase; this results in an increased revenue for your business. SEO executed correctly can be one of the best marketing tools for your website. To get in touch with the best website design Bournemouth can offer you, simply call South Coast Web on 01202 665855 where our design team will be happy to help. Alternatively, our SEO and development teams can assist you on other aspects of your website to ensure it reaches its maximum potential. We look forward to meeting you and working on your website.